METRO GROUP annual report 2015/16 - nexxar lab. METRO’s clear focus on digital reporting. 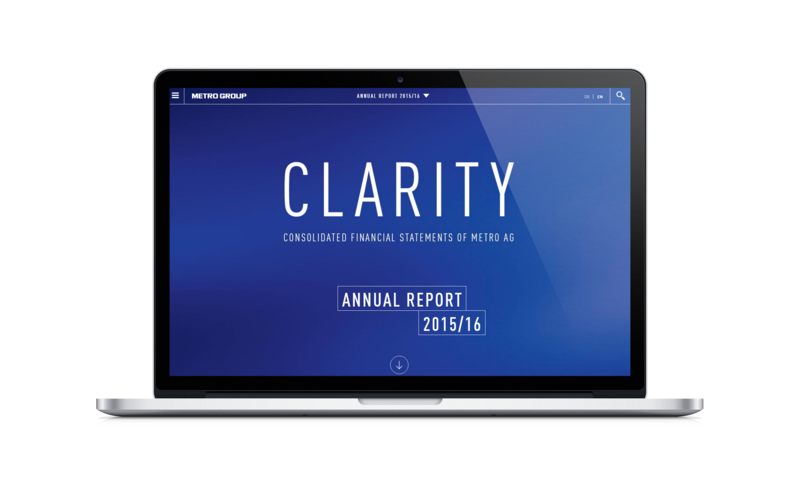 Clarity is the guiding topic of this year’s METRO GROUP corporate reports. Clarity is understood as an important key to success, growth and excellence. With the recently released 2015/16 reports METRO GROUP increases its transparency for its customers, employees and investors. Clarity also extends to the publication structure: The Annual Report 2015/16 is supplemented by the Condensed Report and accompanied by the Corporate Responsibility Report. The Condensed Report gives an overview of the financial year 2015/16. Information is more compact and large text blocks are brightened up by visual elements, quotes or key figures to enhance readability. In order to provide perfect orientation we also created the Reporting Home, a landing page for all three reports. Additionally a drop down changing report navigation allows to easily switch between the three reports. 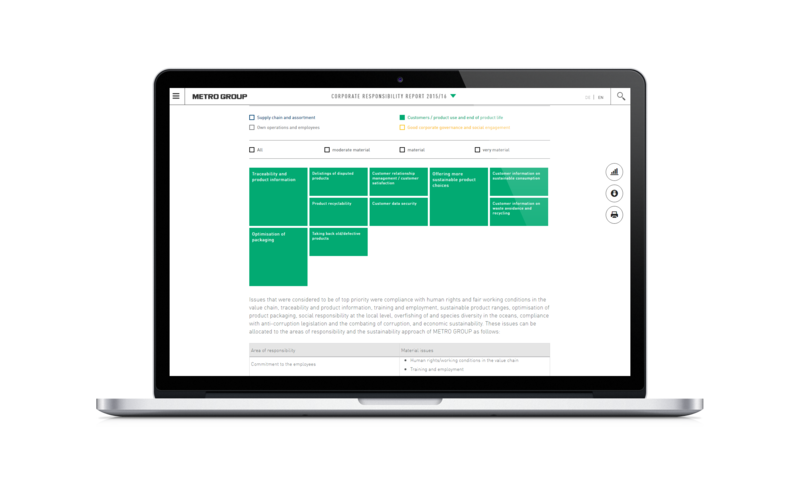 The company also made a clear decision for its reporting: for the Corporate Responsibility Report METRO uses the multi-channel publishing approach Online First – developed by nexxar – for the first time. From the beginning on nexxar accompanied the conception and implementation of the report and set the course for the new process. 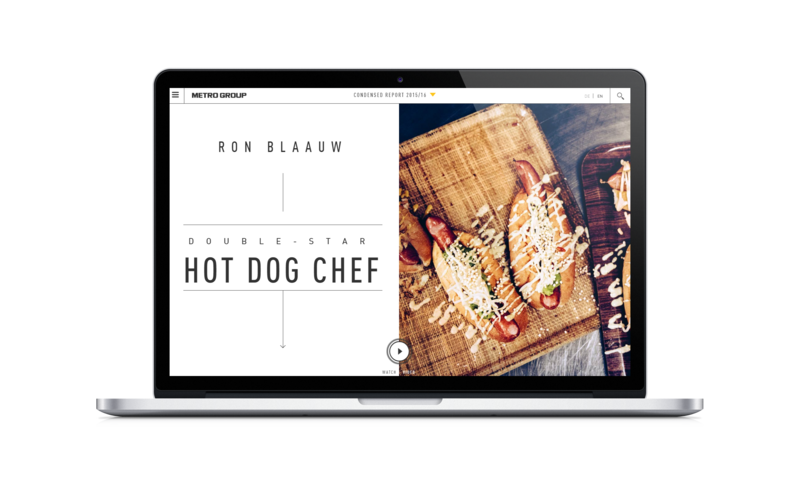 Instead of converting content from ready-to-print documents to HTML, our development started online. During both report conception and content creation, the focus was always placed on what works best on screen. The report PDF can be generated and formatted anytime from the online report, at the push of a button. The magazines of the Condensed and the CR Report portray some of METRO´s innovative customers, partners and employees. 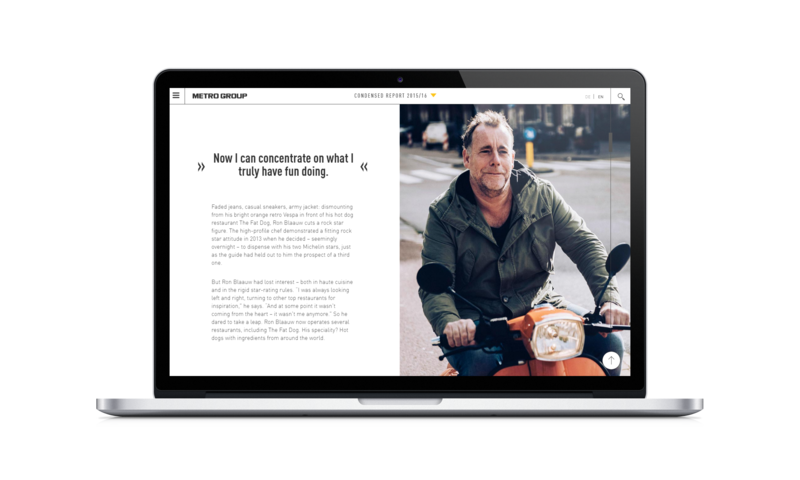 Split screen waterfall pages tell the exceptional stories in a very personal manner and therefore show the additional value of online storytelling: Cinemagraphs, videos, quotes and a lively text style are composed to enjoyable and informative portraits. 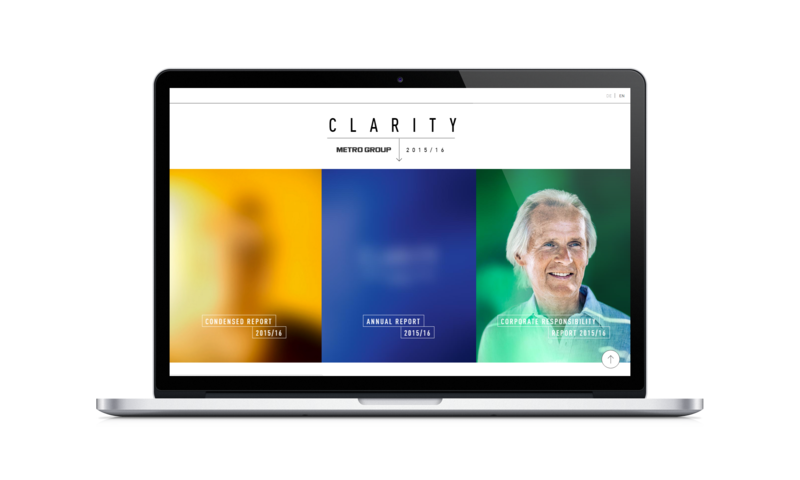 Another remarkable characteristic of the reports are the numerous videos: beside the videos embedded in the magazines Olaf Koch, Chairman of the Management Board, and Pieter Haas, Member of the Management Board, explain personally what “Clarity” means to them and the success of the group. The pictures of the Management Board were made in an extraordinary way for last year’s report. This year we rely on cinemagraphs that show slight movements of the board members which creates a surprising effect and appear more personal. The potentials of online reporting are also revealed by interactive elements throughout the report. One example is the materiality analysis very often presented as static coordinate graphic. METRO’s Corporate Responsibility Report provides an interactive version. Users can sort the material issues by category or significance. The individual topics are linked with further information inside the report. Another interactive example is a chart that shows the aspects of METRO’s focus on customer values.